These are some of the materials I use with my students. Some are exercises I created to work on specific technical issues, some are arrangements of requested tunes, others are traditional cello methods available for download elsewhere on the Web. This is an evil work-out for the fourth (pinky) finger, strive to play it in tune – that means stretching that fourth finger! If you start to feel a strain in your left hand or forearm stop and shake it out, rest your left hand before resuming. Especially for adult students: an entertaining presentation by OHSU neuroscientist Larry Sherman, Ph.D. In case you needed any extra encouragement to stick with your music lessons! 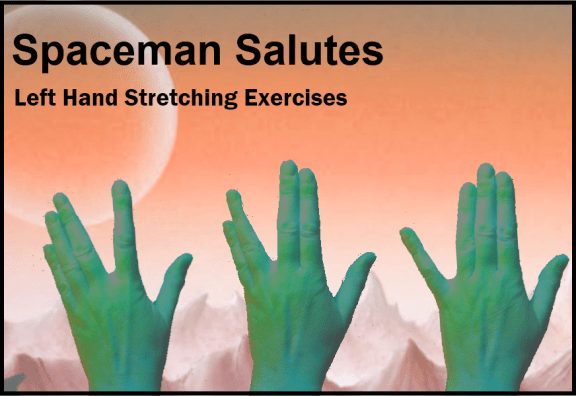 You can do these stretching exercises anywhere, anytime. Especially useful for young students to get used to moving fingers independently of one another.